Note: This is a guest post from Benjamin Hardy, who is the author of Slipstream Time Hacking and is currently pursuing a PhD. You can find him on his blog and on Twitter. I started blogging seriously in May of 2015. However, I didn’t want to solely publish at my own blog, since literally no one except my wife knew it existed. So every time I published an article on my blog, I copy and pasted it into Medium.com and published it there as well. Medium is a popular and innovative platform based in Silicon Valley. The readers (and writers) at Medium are interested in entrepreneurship, self-improvement, cool ideas, good research, interesting stories, and lots more. At Medium, content really is king. You may have a huge platform or be “well-connected,” but those things only get you so far at Medium. Only the best content consistently gets pushed to the top, regardless of your current following. This is an enormous advantage as what you write is completely in your control. So, if you’re willing to write content “so good it cannot be ignored”—hopefully every writer’s goal—you can use Medium to launch your writing career and build your platform. Had articles published on outlets like Huffington Post, the Observer, and am now in works with TIME. Last May, I really started researching the publishing industry. I had written an eBook and was anxious to know how to traditionally publish it. I decided literary agents would be my best resource. After all, they know the publishing industry back-and-forth. After talking to 5–10 different agents about their coaching programs, it became apparent my questions would need to be answered elsewhere. I started looking at people’s blogs who I perceived to be successful. One dominant theme was that many of these bloggers referenced places their work was featured (e.g., Forbes). I made Huffington Post by December 2015 my goal. I started by pitching articles to self-improvement blogs like Addicted2Success.com and Purposefairy.com. I also wrote a few articles on my own blog and republished them at Medium. The image below shows my May and June performance. Note, before May, I had never published anything on Medium. Before May, I had written five or so articles on my own blog and a non-published eBook. A few notes: the far left column is the title of the article. The next column is the amount of views (i.e., clicks) each article received, followed by the number of actual reads, the percentage of reads compared to views, and lastly, the amount of times that article was “Recommended” (similar to “Liked” on Facebook). As can be seen in the image, one of my articles in June went viral. Honestly, I wasn’t at all prepared for the traffic my website got when this happened. My website was extremely crappy (like, the worst). More importantly, my website OPT-IN (where you collect email addresses) was not center stage, but small and on the right hand column. While my viral article was getting the initial wave of traffic (approximately 200,000 clicks per day on Medium), I only received 40 subscribers to my blog. Surely I should be getting thousands of subscribers with this kind of traffic? After adding this simple “call to action” (i.e., Connect Deeper), I jumped to 3,500 subscribers in just a few days. Unfortunately for me, this edit was done after most of the traffic had come and gone. So, I missed a huge opportunity, but learned an important lesson. And that’s where my subscriber-base would sit for the next four months. The day my article went viral, I was contacted by Business Insider, Huffington Post, and the Observer, all asking if they could republish the article. My goal of two weeks prior was abruptly achieved. For the next few months, I wrote exclusively at the Observer. During this time, my writing improved dramatically thanks to my editor there. In October (four months later), I transitioned back to writing at Medium. Since returning to Medium in late October, I have increased from 3,500 to 20,000 email subscribers. And in December, I revamped my website, making it far more professional. As you can see, there are spikes and drops. However, on Medium, when you have one article that’s getting a lot of traffic, it’s good to publish others. The traffic from one ripples into the traffic of other freshly published articles—they can assist one another. Furthermore, the traffic from my newly published articles also brought attention back to my article published in June, which rippled back into the newer articles—generating more traffic and more subscribers. For example, the image below shows three of my articles hitting the Top 5 Trending on Medium, two published in January, one from the previous June. In truth, most of my subscribers have come in the months of December and January. In the past two months, I’ve increased by 13,000 subscribers. The image below shows my current subscriber base as found in my Infusionsoft management account. Note that 33% were from the last 30 days. From here on out, I’ll dig into my writing process and some of my strategies for writing valuable material. Our culture has become obsessed with working hard and being busy while simultaneously trivializing the importance of play. Indeed, “The only kind [of play] we honor is competitive play,” says Bowen F. White, MD, a medical doctor and author of Why Normal Isn’t Healthy. My approach to writing is to have as much fun as possible. That’s what guides my writing process and my writing progress. For me, it’s like snowboarding—if I’m too serious about it, I’ve missed the point. So I’m just trying new tricks on my snowboard and pushing my creative boundaries because it’s fun. When it stops being fun, I take a step back and question my motivations. Tim Ferriss doesn’t do what he thinks will make him happy. He does what excites him. Although his overarching vision remains consistent, Ferriss doesn’t have long-term plans. Instead, he does short-term (e.g., a few months) “experiments,” which he puts all of his energy into. He has no clue what doors may open as a result of these experiments, so why make long-term plans? He’d rather respond to the brilliant and best opportunities that arise, taking him in now unforeseen directions. I’ve recently adopted Ferriss’ concept of doing short-term experiments. This has changed my approach to work. For example, a few months ago I stumbled upon a personal development article that had over 1,000,000 social shares. I decided to perform an experiment to attempt creating an article that would also get 1,000,000 shares. The result was this article. Although the article hasn’t been shared a million times yet, the results were profound and unexpected. It drew the attention of an editor at TIME who asked if they could syndicate it at the end of February. Additionally, the article attracted several thousand new readers (including some of my favorite authors & researchers) and subscribers to my blog. Lastly, it connected me with a better web-developer and new coaching clients. All from one short experiment that took a week to perform. Experiments are a fun way to pursue goals because they allow you to get innovative and bold. Experiments are short-term — and thus relatively low risk. They are your “moon shots.” Why play small? What’s the worst that could happen, you waste a few weeks or months and learn a lot while doing it? Trying to get several articles into the “Top Stories On Medium” simultaneously was another experiment I tried in December. Even this very article, the one you’re currently reading, is an experiment. Who knows what the results will be? I believe most people fail at achieving their goals and resolutions because they perceive their goals to be drudgery. Instead of traditional goal-setting—which is too serious and lacks the whimsy of an epic adventure—I’ve framed my goals as a bucket list. Each item on my bucket list becomes an epic quest to achieve. According to Chris Guillebeau, in his book, The Happiness of Pursuit, a quest has a defined beginning and an end. It has various stages and levels, like a video game. It can’t be easy. Challenge is the essence of adventure, and thus, the essence of a quest. A quest must be attainable. For example, Guillebeau didn’t set out to visit every planet in the solar system, but to visit every country in the world (which he completed). Lastly, it must be something pulling deeply at you. If you didn’t do this thing, you’d regret it. Hence, the bucket list informs the quests you undertake. As an example, rather than trying to publish three articles per week, I’m questing to get published on my favorite platforms. Instead of running four times per week, I’m training for an ultramarathon. This approach to goal-setting—and living in general—is proactively designing your life around your highest ideals, which is the opposite of what most people do. Most people try to squeeze their dreams and highest ideals into the “margins” of their busy lives. As Stephen Covey explained, “If the ladder is not leaning against the right wall, every step we take just gets us to the wrong place faster.” Thus, pursuing your highest ideals as your top priority keeps you honest to yourself, and allows you to not get caught up in other people’s agendas. It also makes life a lot of fun! Every article is an opportunity. Don’t publish articles just to hit publish. One blog post could change the entire trajectory of your career. I believe I’ve had success on Medium because my articles are jam-packed. They aren’t fluffy. They’re dense—and often need to be read and re-read several times. People regularly tell me they’ve printed-out one of my articles and stuck it to their fridge so they can read it daily. When I write an article, I’m not concerned about how long it will be. Instead, I focus on how good I can make it. I want my art to leave people better than it found them, including you. In the book Originals, Adam Grant explains that “originals” (i.e., people who create innovative work) are not reliable. In other words, not everything they produce is extraordinary. And the same is true for you. In order to produce your magnum opus, you’ll need to create a high volume of work. You have to kiss a lot of frogs to find your prince. Quantity is the most likely path to quality. The more you produce, the more ideas you will have—some of which will be innovative and original. And you never know which ones will click. You just keep creating. Not every article should be in list format. But why neglect what works? People love articles written as lists. Consequently, I frame a large portion of my articles as lists. And to be honest, those are the ones that consistently do the best. Within the flexible framework of a list, you have loads of room for creativity. My “list” articles are packed with information and sometimes very long. There are no rules. Just strategies that work or don’t work. Lists—if done well—work. 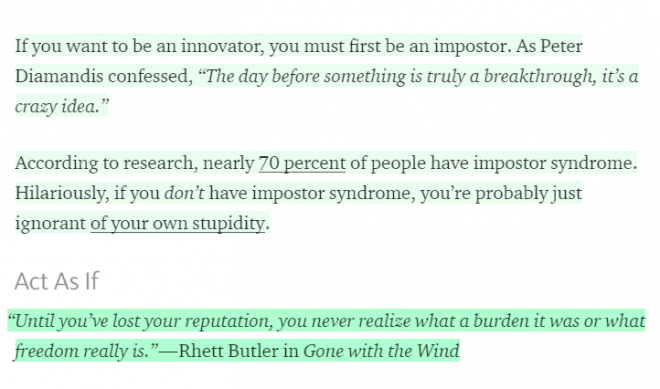 The following image comes from an article I published last week about why I believe we should embrace, rather than avoid, imposter syndrome. Having great quotes and using research gives you credibility. It also makes your writing more well-rounded and powerful. My two most viral articles included elements of surprise. For example, my morning routine article told people they should take cold showers in the morning. Although the rest of the article was good (in my opinion), that one surprising element was the tipping-point. Similarly, another successful article started with, “Stop Consuming Caffeine.” Although that turned many people off, it also startled and surprised a lot of people. Add some shock-factor to your writing. Give people something that is either counter-cultural or something they haven’t thought of before but which is relevant and important. Your biggest problem is obscurity—other people don’t know you and aren’t thinking about you. Personally, I don’t care where my stuff is published. As long as the reader is directed back to my website, anyone who asks if they can republish my work can have it (including you). My only stipulation is that they keep my Connect Deeper section with links back to my website at the end of every article they republish. This may not be good for SEO purposes. And I may change my strategy in the future. But for now, my goal is to “become omnipresent” as Grant Cardone calls it. I want to increase my odds of getting my writing in front of the right readers and potential collaborators. Only on rare occasion (like this), will I write an exclusive article. So there you have it. I did it. I’m doing it. And you can, too. Have you published anything on Medium? Which of Benjamin’s tactics do you want to try first? Share in the comments. Benjamin and his wife, Lauren, are the foster parents of 3 epic kids. He is pursuing his PhD in Industrial and Organizational Psychology at Clemson University. His work has been featured at Psychology Today, Huffington Post, Business Insider, New York Observer, Thought Catalog, and others. Very informative article! I haven’t thought about using Medium to republish my blog posts. I will definitely look into it. I’m glad you got value from this article! Look forward to seeing you on Medium! This post is full of wisdom! I’ve just started attempting to revitalize a long-dormant blog, and I’ve already set a few goals … just don’t know how to get them started. The information here helps. Thanks! Get that blog going again! This is absolute gold, Benjamin. Really good stuff. I recently started re-publishing my posts on Medium and I’ve seen a little bit of traction (more so recently, now I’m writing longer, more in-depth pieces with really actionable advice – I’m practicing MUCH higher quality over quantity this year! ), particularly when my pieces get picked up by “publications” on Medium. Question: When you first started publishing on Medium, how did you get your writing in front of more eyeballs? To me, Medium often feels like a massive black void filled with millions and millions of articles that go un-read and un-discovered. I use the tags provided and I accept it to relevant Medium “publications” that request it, but it still feels like I’m missing something. I really enjoyed reading this, and I’m heading over to Medium now to check out more of your pieces! You can reach out to publications and ask them if they’ll publish your work. That would be one way to get more eye-balls. Other ways are to work on your titles (as obvious as that seems). Blog titles are a huge part of the battle. They need to be so good people can’t not click them. From my experience, the title and introduction are the real battle. It doesn’t matter how amazing your content is if people don’t get to it. Another way is getting people with a following to “recommend” you articles. Amazing post. I will take this advice to heart and begin looking at Medium right away. Thanks for your insight. I learned so much from this article, such as the quality of a post is more important than the length. Looking forward to reading more! Glad you got value out of the article, Anna! Benjamin – thank you for this insightful article. I have been considering posting my content to medium.com and this pushed me over the edge. Thanks Benjamin. This is another one of the benefits of reading other people’s articles. I never knew medium existed. I just set up an account to start sharing over their as well. Thanks again, and best prayers for your doctoral journey and future endeavors. Thank you for your kind words 🙂 Good luck on Medium! Feel free to reach out anytime! Hi, Benjamin! I’ve been reading your articles on Medium for months, and I’m glad for your success because you are a great writer. I was going to ask you this on Medium when I found this article on Jeff’s blog: How do you manage to products so much? I’d love to read about your process. Hey Benjamin. Congrats on the success! You’re obviously a crafty creative and I’m thankful you shared your story. You showed me I’m thinking too small. Lots of possibilities and approaches out there. Thanks again and well done all around. Thanks for your kind words! Good luck in your endeavors! Thank you for the advice, Benjamin! It is great to hear a successful blogger share his wisdom and experiences. All of the tips you provided are very helpful and insightful. 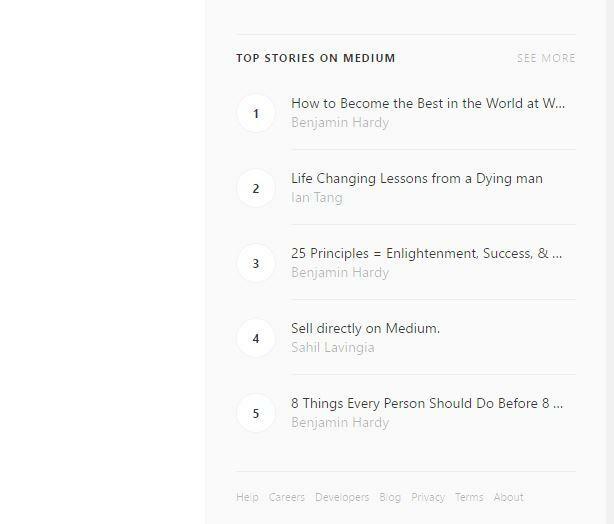 Before reading your article, I had never heard of Medium, but I will check it out now! Do you think having an eye-catching headline (along with excellent content of course) is the easiest way to get more clicks on your post if you’re using Medium? I do think there is an art to having catchy titles. 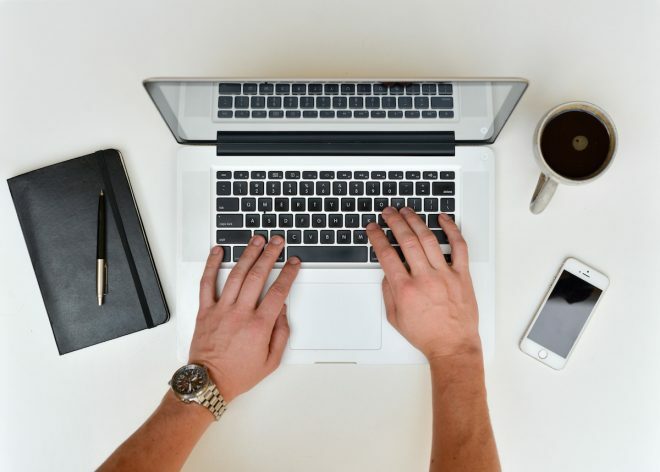 As much as people complain about it, catchy titles get more clicks, which allows you to get more reads. Thank you, Benjamin and Jeff, introducing me to Medium! True: plant abundant, harvest few! You’re welcome! Cheers to your success! Thanks for this great resource! Like many others I didn’t know about Medium, but I am excited to get started and see how it goes. I’m pretty new to this blogging thing so any advice is super helpful. Thanks for taking the time to write this, and to Jeff for posting it. Good luck in your new journey, Darren. You’ve found an incredible resource in Jeff Goins. He’s been incredibly helpful for my journey the past year or so. I agree. Just signed up for your email list too. I look forward to joining in your journey as well. Nice– you sold me on writing for Medium. But doesn’t copying a post from your blog and publishing it on Medium get tracked by google as duplicate content and an SEO hit? In theory, you should be okay if you wait until Google has indexed the post on your site, before you duplicate it on Medium. Thanks– but I’m pretty sure that’s the definition of duplicate content. Google won’t recognize it as duplicate until it’s indexed it. Well, yes, that is true. But it is the “duplicate” that is ignored, or was in the past. It used to be that the only time you created an issue for yourself by creating another copy, once the first is indexed, is when that second copy is also on your own site. From what Neil’s post indicates, things have changed again. Using a rel=canonical in the duplicate, as Neil suggests, seems to be the safest way to go if you want to duplicate on another site. Google changes their rules and ranking factors at whim, and mostly we’re left to guess at them. Personally, I’d rewrite if I really had to have the same content in both places. You can restructure the same ideas fairly quickly if you need to. I also think that if you have an opportunity to post on an influential site, the value of the link is such that it’s worth giving them original content. I’m actually suprised that Medium would allow content that’s been posted elsewhere. I employ a similar strategy as Ben and it works for me. In my opinion getting my voice heard and building a following is a bazillion times more important than SEO. Take Jeff for example. Does he benefit from SEO? Yes. But his success is largely due to the massive platform he built by putting himself out there. I can’t speak to your situation but oftentimes I see people who are way too focused on tactical and technical aspects when their number one concern should be finding people who give a Damn about their work. Jon Morrow, an expert blogger, says not to even worry about SEO for the first year. If you’re a Jeff Goins then yes, but if you’re fighting to get your name out of obscurity I think you should want to present your work anyhere and everywhere that allws you to. I’ve tried Medium. One post has eight views with one read. Everything else has zero. I can’t say I’ve used all of your strategies, but such ridiculously low numbers make me hesitant to spend any time on Medium’s site uploading blog posts. Feel free to reach out sometime and I’ll look at your work. Happy to give some brief feedback on titles and introductions (if you want). “Whatever you do, keep in mind that it is not all right to have duplicate content roaming around the web without a rel=canonical. In the short run, you may get more traffic, but eventually Google will penalize you.” from Neil Patel (sorry for duplicating your content Neil). From my experience, very little of my “traffic” comes from google searching. Generally, the life of an article is quite short. For me, it’s better to get the content in relevant social channels. Great post. I’ve been copying my blog posts onto Medium for awhile but you’ve shared some stuff I haven’t done-but will! Thanks! Good luck, John! Feel free to reach out! Thanks so much, Benjamin, for your helpful writing. I am just starting my own journey starting a blog about my passions, and I thank you for giving me a head start by learning from your successes (and failures)! Great article I will refer to often. Thanks Jeff and Benjamin. I’ve just recently heard of Medium. Now I’ve subscribed and will spend time investigating this as my blog is relatively new and I don’t have a large tribe yet. I’ve been wanting to start a blog for quite some time but no idea what to write about. I will keep these helpful tips in mind when I start it. It’s true, you’re everywhere at the moment. But that’s only a true testament to the quality your writing produces. Steven, Thank you man! I appreciate your kind words and support! Great post Ben, incredibly insightful tips. I have been reading your posts on Medium. Haven’t had much success yet on Medium but I’m not giving up. Following you keenly, would be glad if you can have a look at my latest post on Marie Forleo’s “Make Every Man Want You” on Medium, Thanks. I just recommended it 🙂 Hope that helps. This is a fantastic post, Ben! I love your statement, “Faith and fear cannot co-exist in the same person at the same time.” I truly believe that, thank you for the helpful tips! I agree! You need to have faith if you’re going to make it in this work. It’s not easy and will challenge you to the core. This is amazing. I just created my own medium account. So excited! Thanks for sharing your tips. You’re welcome! Feel free to reach out anytime if you need some support on Medium! This is really amazing stuff Benjamin, thanks for sharing. You’re very welcome! I hope it serves you as you try to bless others with your writing. One of the best articles I have read in a long time. Thank you! I particularly like the month-long experiment idea. You are my new hero. This post was just the inspiration I needed. Thanks! All I can say is wow. Thank you for reminding me it’s all about having fun too. We forget that sometimes. I too am going to start cross posting my blog posts to medium and linkedin and see how it goes from there. Wrote a post about it on my blog too. Definitely one of the best post I’ve read. Just realize we can re-published our articles on Medium. I though we need to write a new ones like guest blogging. 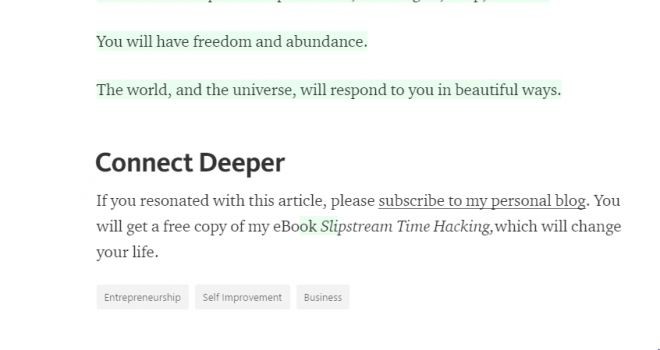 How about attribution when copy paste our articles on Medium? Is it we simply link back as a source? Awesome post, thanks for sharing Ben! I love the idea of adding an element of surprise in your content to keep the audience on their toes. It’s clear to see why your posts have gone viral if this is an example! The listicle PLUS your own twists and elaboration make it excellent. Congratulations! Hi Benjamin, reading your long and excellent article has been enlightening in the sense that length doesn’t matter so much if what you are writing is relevant. Thanks for adding some fresh ideas to all the usual tips on blogging – fun is important, creating a lot for the joy of creating has become something of a lost art and maybe we’d all do better if we stopped being overly serious! I have been cross-posting on Medium for a while but I am beginning to wonder if Medium favours certain topics more than others, because I don’t get nearly as much response on there as I do on Niume. What do you think? Good Article… Although most of the information here is not new. What seems to be different are the number of views and subscribers you received. Without being too cryptic or mystical… there seems to be an “invisible” element to popular content. Popular content is good content, but it’s not always the best content. Maybe readers can “feel” the enthusiasm behind the words…. I’d say this article is a testament to that. Impressive work Benjamin and thank you for sharing your insights. I agree, when you dream, dream large and set your focus to achieve your dream and make them your reality. Medium is not just filled with more than half a billion users, they are voracious readers, as well as avid commentators. It’s not enough to publish any kind of content, it should be great content where everybody realizes value while being entertained. Well done on a great article!